Prior to sitting down and writing this article, I did exactly what many other Americans do on a daily basis. I poured myself a rich cup of black coffee. My brew being rich is exactly my point; coffee is a luxurious commodity. One local Fort Wayne gourmet coffee company is seeking to change the way coffee loving consumers brew. Brendon Maxwell, understands that not only is coffee the most popular American drink (after water) and the second most traded commodity in the world, coffee also has the ability to improve lives. That’s why he co-founded Utopian Coffee Company, an organization dedicated to delivering gourmet, fresh roasted coffee right to your doorstep that gives back to both the local community, and to the communities that provide the raw product. How do you select your coffee? Do you choose a favorite flavor? Maybe for you, it’s all about the presentation. Do you prefer coffee beans, ground coffee, or K-cups? Do you attempt to be socially responsible and choose coffee that wears a “fair trade” or “organic” label? For many, this is where the process ends. Do you consider where your money goes after you make your purchase? Although the average coffee drinker will spend $164.71 a year on coffee, the sad reality is, most of the money will not return to the farmers who, day in and day out, dedicate so much hard work to harvesting coffee. Utopian extinguishes the mindset of mindless coffee purchasing. 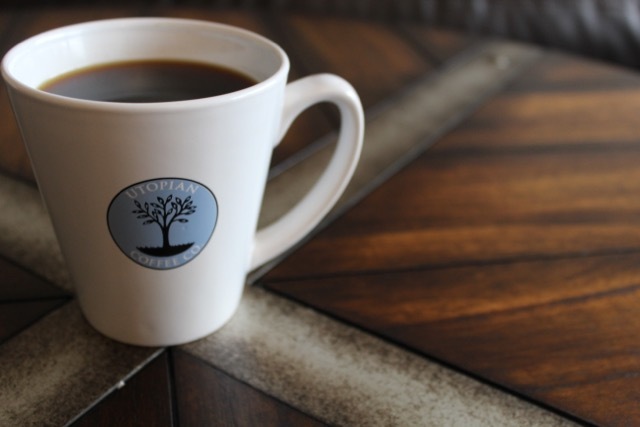 With Utopian Coffee, your daily cup of joe has the capability to help a farmer in Guatemala send his children to school. In Rwanda, your purchase can help provide bikes for workers, so they no longer have to carry 150 pound bags of coffee. In Congo, a country in turmoil where many of the men are often fighting, your coffee purchases help support education programs for women. With each purchase, Utopian is committed to "connect people and impact the world." For example, profits from purchases are going to support education for the children of a farmer in Guatemala. The farmer and his family hand sort every coffee cherry. The normal picker will average 100 to 200 pounds of coffee cherries a day, and this will yield about 20 to 40 pounds of coffee. In a time where $18 billion is spent annually in the US on specialty coffee, there are plenty of economic opportunities to be had. Utopian separates itself from other brands of socially responsible coffee by taking their support beyond a distant relationship. Maxwell recently visited the Guatemalan farmer’s home and sat side by side with the family sorting green (raw) coffee. Maxwell walked the fields and experienced the daily lives of his Utopian business partner. He brought his experiences home, passed them on to his Utopian customers, and completed the “connecting people” part of his mission. Utopian Coffee Company promotes educated coffee consumers, sustainability for farmers, and is a visionary local Fort Wayne Business. I will cheer my dark roast to that.